These images are all illustrations for some of my Fanfics. DISCLAIMER: Most of these images are fanart produced for entertainment purposes only. Yu-Gi-Oh! and all related characters are the creations of Kazuki Takahashi. 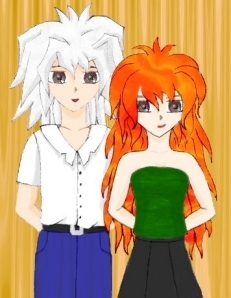 Ryou and Kura are all dressed up and ready to go to the ball... er... dance. Yes, that delicate redhead is Bakura in female form. He really is bad with those spells. 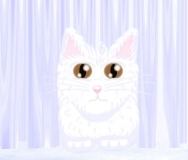 This is Bakura-kitten peeking out from under Ryou's bed. He was hiding there because he thought Ryou would be mad at him for making a mess of the kitchen. This is Bakura-kitten having some fun with a shoelace while Ryou gets ready for bed. He was embarrassed when Ryou caught him playing, but Ryou thought it was cute. 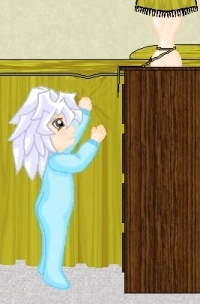 This is Bakura-chibi about to rid the world of a lamp that is in extremely bad taste. Unfortunately, Ryou will have to get his father a new one just like it. 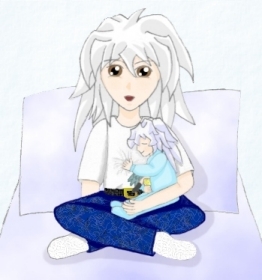 At the end of a long day of caring for Bakura-chibi, the little yami falls asleep, hugging his Dark Witch plushie, and Ryou finally gets a chance to sit down and relax. 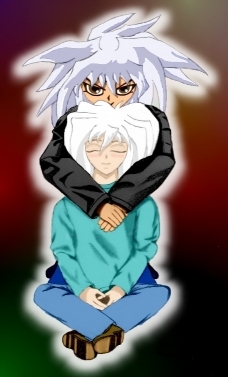 Bakura learned a valuable lesson on Halloween. Never make a wager with a costume-shop salesgirl that you've just insulted. You'll end up embarrassing yourself. Meet most of the original characters from the fic. From left to right: (shh it's a secret), Nyc Lyons, Callie Logan, Avril Kensington, Rina Price, (shh it's a secret), Evian Sanders. Not shown: Emi. Meet most of the original characters from the fic. 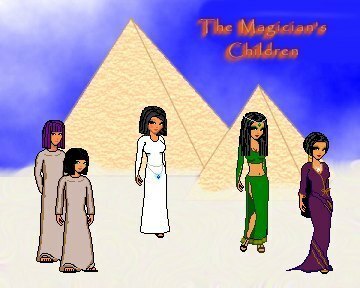 From left to right: Eldest Son, Youngest Son, Youngest Daughter, Mariasha, Akila. Not shown: Alasdair, Little Servant Girl, (shh it's a secret). 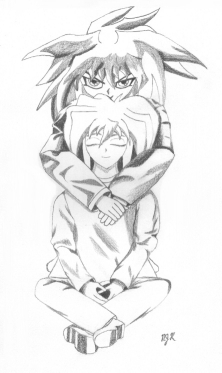 Is Bakura protecting Ryou or is it the other way around? Perhaps they are protecting each other. This comes from a story I'm currently working on. 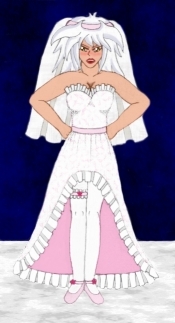 This is the original drawing that I coloured. I like this drawing a lot so I thought I'd include it here.